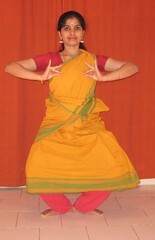 Over the previous posts, I have explained the First, Second, Third and Fourth Steps in Tatta Adavu. If you have been following the same, you would be acquainted with the rythmic leg taps in this Adavu. Watch the Tatta Adavu Video here. Today I describe the penultimate step in this first Adavu. In this step, we tap the leg five times on each side. Please repeat and note the Bols (sollukattu) for each of the taps. 1. Stay in the Ardhamandal position. Place your palms on the waist with the inside of the palm facing out. Avoid the common pitfalls as you practice the steps in this posture. 2. Lift your right leg towards the inner thigh and tap it on the ground (say”tai ya”), lift the right leg again and tap the floor with flat feet (say”tai hi”). Again lift the same leg (right) and tap the floor with flat feet say (“tai”) , Tap the floor again with the right leg (say”tai”). Lastly again lift your right leg and tap it with flat feet (say”tam”). Here we finish one count. 3.For the second count lift your left leg and tap it on the ground (say”tai ya”), again lift your left leg and tap the floor with flat feet (say”tai hi”). Again tap the left feet flat on the ground (say”tai”) . Tap the floor again with left feet (say”tai) and once again tap a final time with the left feet (say”tam”). 4. Please note that when we are doing this step “tai ya” & “tai hi” taps are slow. Comparatively, the taps with “tai”, “tai” & “tam” (the last three taps) are fast taps.This is because we are using every syllable to tap in tai, tai & tam. Whereas in the former(“tai ya” and “tai hi”), every two syllable makes one tap. Thanks for all the appreciative comments and mails. I shall post the final step of this adavu soon and then continue to Nattu and Visharu adavus.